Since our last update we have been featured by GBGM in their “Hallelujah Moments” bulletin insert program with a story on the orphan baby that has been receiving free milk from our project for the past year and a half. The Missionaries read their report on activities at Mujila Falls Agriculture Centre and Paul Webster chaired the Economic and Church Development Committee (ECDC). Both Tshala and Paul were active on the floor of the Conference helping to inform the Conference on the importance of following the Book of Discipline, respecting African Culture within the bounds of Christian Teachings, improving financial and statistical reporting from the local church to the Annual Conference, etc. Rev. Webster was re-elected as chairman of the ECDC. A special honor was given to Tshala Mwengo, who was nominated and elected as an alternate to the Central Conference which will select the first United Methodist Bishop of Zambia. For me this was a special moment . Since 1995 I watched the Zambian Missionary Conference grow and develop from a group of informal house churches and thatch rural churches to a new conference with formal churches in many places, agricultural projects, pastor’s training center, industrial training centre, printing shop, handicapped wheel chair assembly center, orphanage, and much more. I know that God is blessing the people of Zambia through your prayers and continued support for the many projects that have taken root here in this very needy party of Africa. Over Easter Weekend I had the honor of performing my first wedding in Africa. It was also my first outdoor wedding and the first one where both the bride and groom wore “dresses”. Michael, the groom, honored his Scottish heritage by wearing the family tartan. 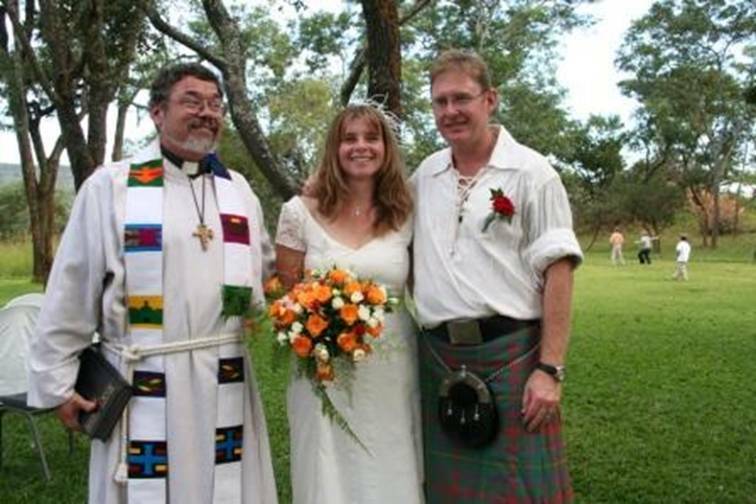 The bride was a school mate of my daughter, Summer, when she went to boarding school in Mkushi, Zambia. The groom’s family was from Cape Town, South Africa and supplied all of the smoked salmon and mussels we could eat as well as all of the fine Champaign and wine that region is famous for. The Bride’s family supplied thousands of cut roses and neighbors chipped in with two hogs and three large lambs for the outdoor barbeque. Needless to say, it was a community event. It was shear pleasure to be amongst farmers for the weekend. The “family values” much talked about in America, really exist here in Africa. The new couple plan to homestead their farm on about 5,000 acres of undeveloped land currently without electrical service. Beef cattle will be their first effort with cropping coming in a second stage once electrical service can be installed and pivot irrigation established. I was treated royally all weekend and was paid, in part, with a ram pump that I have taken back to Mujila Falls. Hopefully, it will provide as many years of service to us here as it has to the family who gave it to me. Contact your local United Methodist Church for instructions on giving. 100% of gift goes to designated project here at Mujila Falls and your gift is tax deductible.